Frozen shoulder (also called adhesive capsulitis) symptoms are typified by stiffness, pain and significant reductions in all ranges of movement. Pain is usually worse at night especially when lying on the effected side or when turning in bed. An incorrect diagnosis of frozen shoulder is usually given for a range of shoulder problems including rotator cuff / impingement syndromes, all of which are very common conditions that can be successfully resolved with simple treatment and advice. 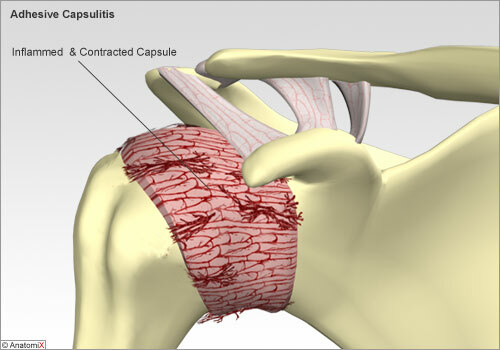 The capsule surrounding the shoulder joint becomes thickened and inflamed and becomes tight around the joint, restricting its movement. Causes are unknown, however, current evidence shows that people who have or who are at risk of having diabetes and those who have recently had to immobilise their shoulder (arm fracture etc) are considered high risk. Symptoms typically begin with all movement of the shoulder causes pain over a period of 4 -6 months and where all ranges of motion become markedly limited. Pain begins to ease during this stage, but where the shoulder becomes stiffer and becomes more difficult to use in daily activities. Treatment is directed towards trigger points that develop on in certain regions of the cuff of muscles and the capsule surrounding the shoulder joint.